Elsah is known as “town that time forgot” and many visitors have walked through its picturesque streets and admired the 19th century architecture of the village. Many of the residents of Elsah have added to its beauty by creating and maintaining lovely gardens which are not normally accessible to visitors. In a special event sponsored by the Elsah Historic Foundation visitors can tour eight of Elsah’s private gardens. So park your car, step back in time, and take a stroll in a village that represents a wonderful sense of history. There will be no need to pack a lunch or wonder where to eat because the folks from My Just Desserts in Alton will be serving their delicious fare at Farley’s Music Hall. Food will also be available at Jeremiah’s on LaSalle Street. Specialty plants from local nurseries and from local gardens will be available for sale. Tickets can be purchased at the Alton Convention & Visitor’s Center at Piasa Street and Broadway in downtown Alton, My Just Deserts in Alton, Green Tree Inn in Elsah, the Village of Elsah Museum, and all Jersey State Bank locations. 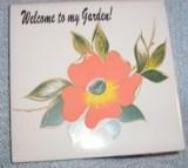 I will be there, too, at the Music Hall, with garden-themed jewelry & glass items, plant pot stickers, magnets, small dishes, and little tiles, such as this poppy tile/trivet ($10). 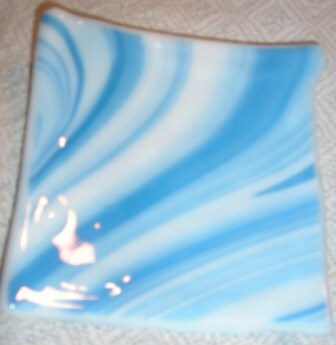 Ever since I heard my Swedish ancestors may have been glassblowers, I have been fascinated by glass. I have always admired Tiffany and Steuben, but I saw myself mainly as a creative writer, not a visual artist. 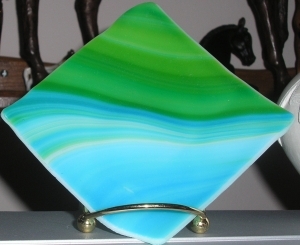 About five years ago I took a flamework beadmaking class – which led to a stained glass class – which led to a fused glass class. Working with hot, cold, and warm colorful glass provides a much-appreciated creative outlet from my day job as a technical writer for Scott Air Force Base, Illinois. Glass offers endless possibilities, is re-usable, and recyclable. I see the world more beautifully through the medium and mystery of glass. 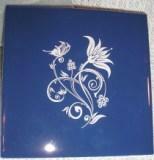 Various commissions for private collections. Donations of artwork to charitable groups to raise money include the Susan G.Komen Foundation, Community Hope Center, leukemia and cancer research, schools, Historic Elsah Foundation, etc. 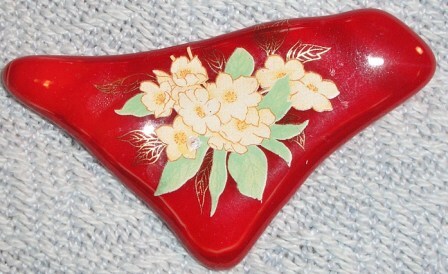 Something about this I like – maybe because it is “oddly shaped and sized”, sort of like me! Perfect to go with your favorite jeans! These lapis-look dyed agate stones look like denim. 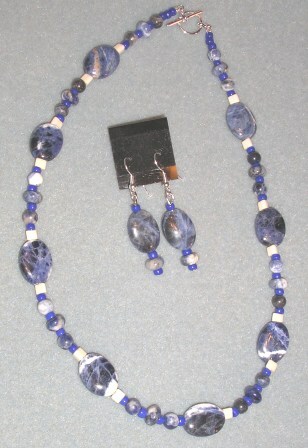 Small round blue beads are sodalite. 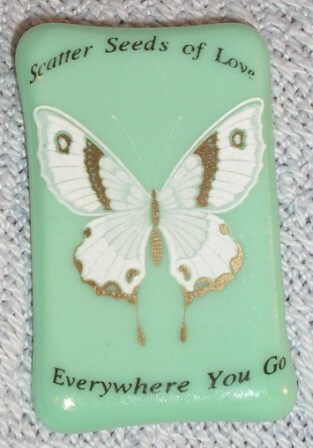 With cream spacer beads. Necklace & earrings – set for $30. 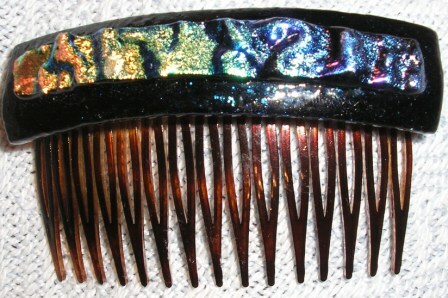 2 3-inch long fused glass hair combs for sale – good for taming thick hair! 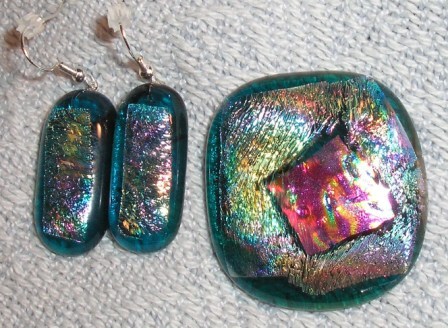 Made with rainbow ripple dichroic glass, one on cathedral (clear) blue glass, one on adventurine (cobalt blue with sparkles) glass. $25 each.